Once the medieval dust settled; the railway line adjoining Düsseldorf and its southerly neighbour Köln brought the Industrial Revolution to town. In doing so, it dragged with it the kindly folk of Benrath; placing them safely into the arms of the functional structures of a modern world. 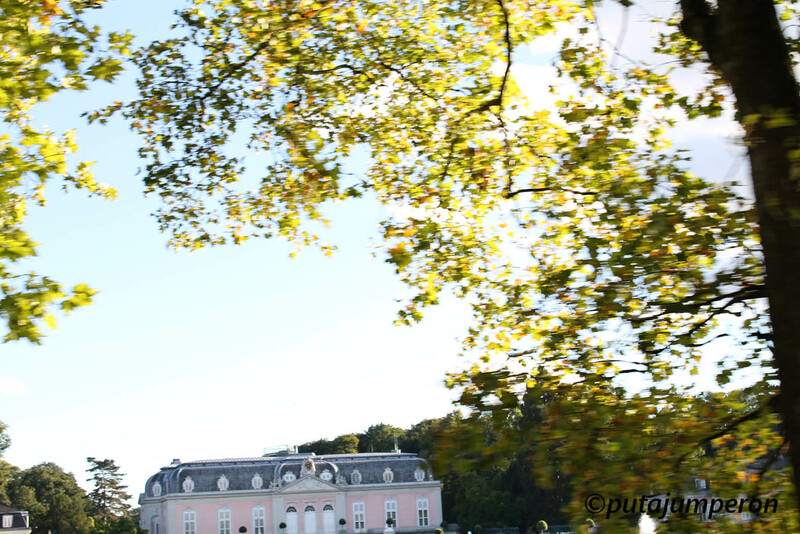 Thankfully, the stunning opulence of Benrath’s Baroque Schloß and its manicured grounds remained relatively untouched, throughout both this grubby era and the troubles of the twentieth century. Driving into the east end of town – disappointingly late due to “big city” traffic – I’d no time time to take in the Karl Theodor’s former residence or it’s carefully maintained flora (but naturally I swept past and grabbed a poor drive-by photo). I’d also arrived too late for the open air concerts therein and, far too early for October’s Candle-lit procession for the Black Madonna. Still, when all else is lost in Deutschland, there’s always trappings of town planning and automobiles to admire, and there is always live sport… and bier, and wurst quite naturally. Ignoring such dietry staples; amongst Benrath’s notable sporting accomplishments, two clubs and one man take the footballing accolades. Local boy Karl Hohmann, turned out for his country twenty-six times over a eight year period in the 1930s, scoring a not-to-be-sneezed-at twenty goals. Whilst the child in me wants to provoke reaction by pointing out the clear superiority of Hohmann’s goal-to-game ratio (0.77) – when compared to Klose, Klinsmann, Rummenigge et al – most notably he scored on his debut away to Denmark. He also bagged his final goal of this haul, in his final game for Die Mannschaft, away to Latvia. Naturally he sits behind the legendary poacher Gerd Müller – who doesn’t? – but in the 1934 World Cup, Hohmann scored both in Germany’s 2-1 Quarter-Final win, over Sweden at the San Siro. Germany eventually finished third. Though born in Düsseldorf, Hohmann began his career at Verein für Leibesübungen Benrath 1906 e.V. (or “Club for Physical Education” as us Anglo-Saxons might say). The most successful of the town’s clubs, VfL Benrath has celebrated claim to fame of having been one of only 63 sides to play in the original 1935 Tschammerpokal 1st Round; the first ever German national football cup competition. Winning 5-0 away to Union Recklinghausen, they subsequently knocked out Eimsbütteler TV 5-3 and VfR Mannheim 3-2, before being eliminated by Schalke in the Quarter Finals. 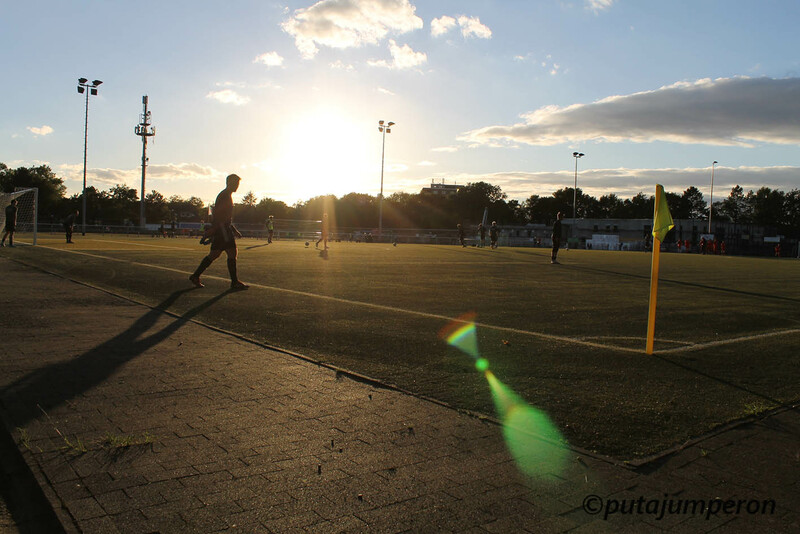 Now playing in the sixth level of German football – Landesliga Niederrhein – VfL receive a bye to the 1st Round of this years Kreispokal Düsseldorf. 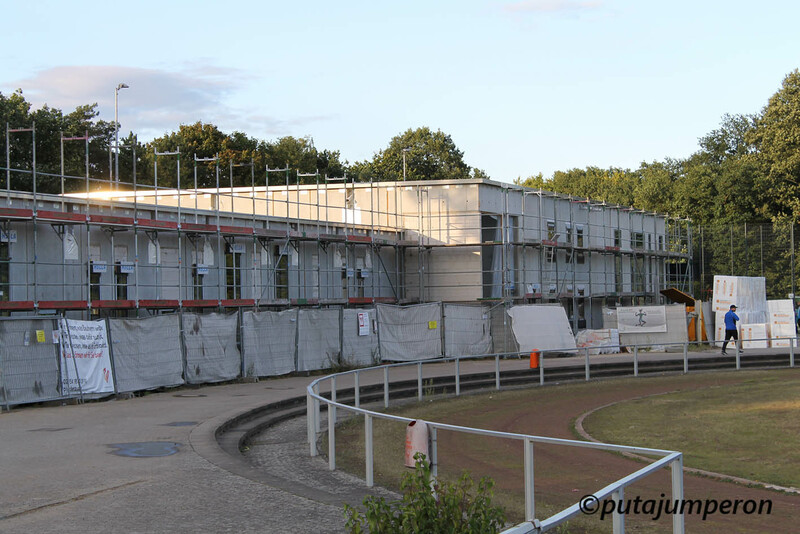 Their neighbours – Sport Gemeinschaft Benrath-Hassels 1910/12 e.V. – being two divisions lower in the Kreisliga A, aren’t so fortunate. With greater parity; these neighbours’ home towns have both suffered from historical hassles (see what I did there?). Whilst Benrath had gobbled up the Knights of Eller’s homestead decades earlier – in an “there’s always a bigger fish” food chain type thing – along with Benrath, that even smaller district of Hassels was swallowed by its big city neighbour in 1929. Though it’s hard to believe when there, now “Düsseldorf” is as far as the eye can see. On a brighter note, being more connected than Kevin Bacon, Hassles is – I’ve calculated – only five degrees of separation from the fall of the Soviet Union…. Founded in 1910, SG Benrath-Hassels sits about 10 miles south of the site of the old Rheinstadion; the site of both first finals, the 1935 Tschammerpokal and the 1953 DFB Pokal. 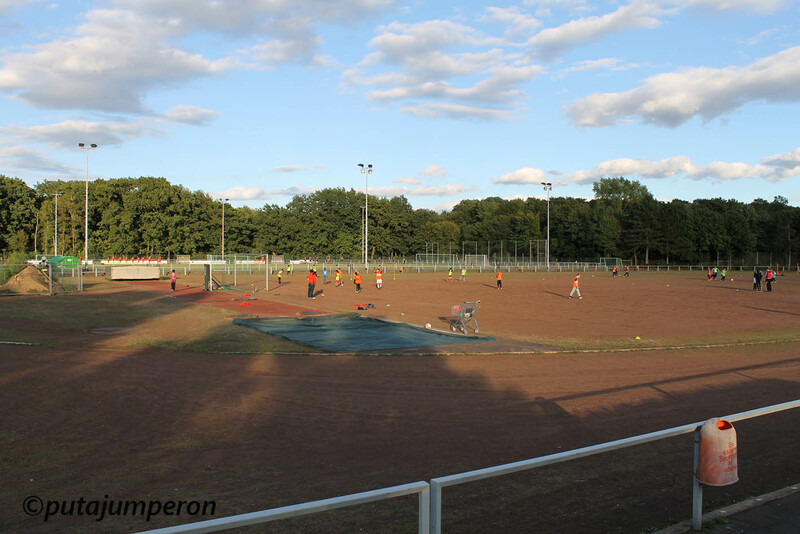 As German sports clubs go; SG is quite small – offering just football and tennis – though upon arrival it was evident this club has far bigger ambitions. On Google earth the impression given is of a ramshackle set-up; a cinder pitch and running track with blurred boundaries, beside it another artifical pitch, and a small training surface. Beyond them in the trees are a number of clay courts, in the shadow of the A59. Rather than being “pre-planned”, it seems to have evolved into its space. 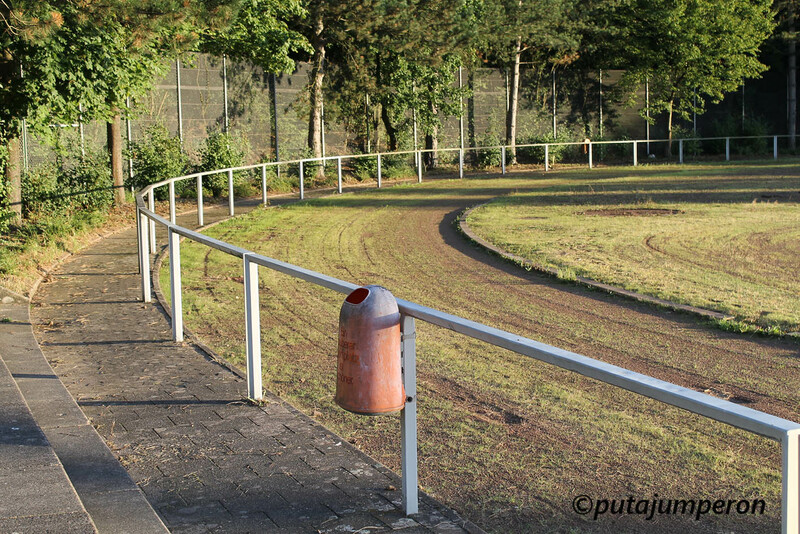 Pulling up in the more than ample car park at the “Am Wald” roadside – as visiting players alighted cars carrying kit and those physios lunch boxes– a sparse treeline did enough the mask out the cinder pitch whilst, at the northerly end of the dead-end street, an empty turnstile was beckoning me in. With free entry confirmed; as I walked round the first block of changing rooms, straight ahead the large oval cinder was home to youth coaching, with parents watching from near side steps. To our right, a bar heaved with refreshment takers who, true to form over-flowed into the outside smoking area. I couldn’t make out the the tennis courts from my vantage point but, over on the astroturf, tonights big-hitters were being put through their paces. Beside them, child protégés on the small pitch were drawing an even bigger crowd. Between me and them, were numerous colour-coded club officials and an impressive construction site. The sun was still out but, any warmth it was emitting was surely going to fade fast. I entered the small clubhouse – past the merchandise cabinet – to find centrepieces on tables and, hot and cold beverages being amiably served in china. I glanced worriedly about. NO SAUSAGES!?!?!? What was place… an aspiring health resort??? Shaken to the core, by this most unGerman of faux pas, I downed my strong black coffee and headed swiftly back outside. Past the colour-coded team officials, the pitch seemed miles away; alongside the construction site, round the running track, past neatly stacked building materials and off to the main arena I trudged, trying desperately catch a glimpse inside the new build as I rethought my dinner plans. In the corner, beside the ever emerging new sportshall, parents beamed with pride at their offspring. Bale, pink Madrid shirt aside, I was equally overjoyed to find that there wasn’t a single reference to the premier league – past or present – on display. Tonight’s Kreispokal pitch was a patched astroturf one of the Loftus Road circa 1981 variety. 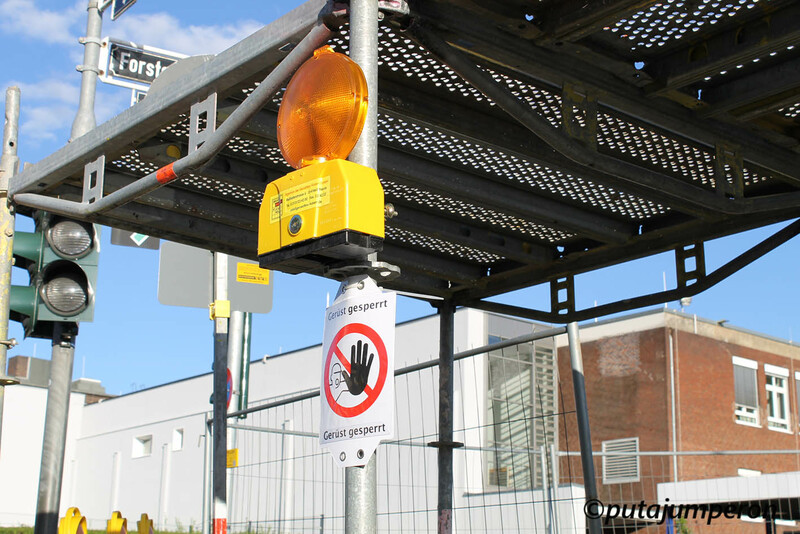 It had a plush aluminium fencing surrounding it. Three gates afforded entrance to the hallowed turf; one at either end big enough for tractors and/or ambulances, the final one stood beside the dugouts, which were – it was noted – facing directly into the setting sun. Three sides of the pitch catered for standing patrons, with the odd backless bench for the elderly. 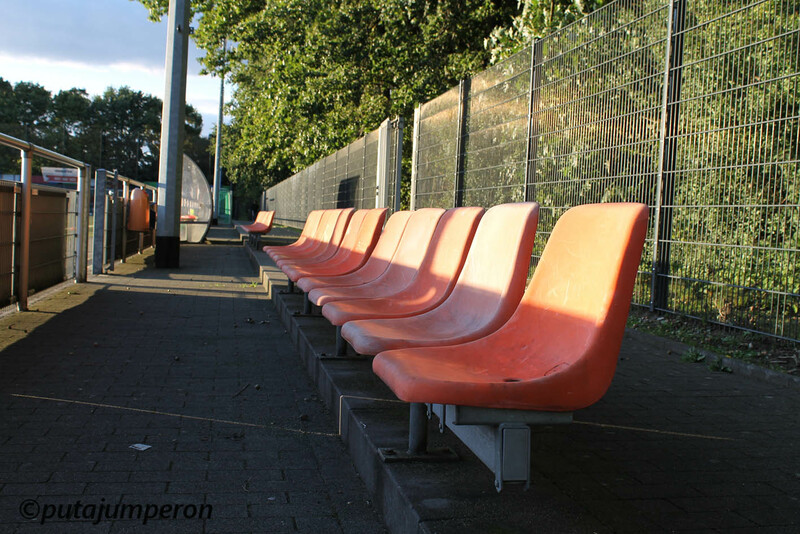 Slightly behind, and in between, the polycarbonate dugouts, were two rows of orange seats. Actually there was one row, broken in two. Raised on a single step, each contained twelve seats, though only seven in total were numbered. Standing facing them; to my right I could see numbers 16 and 12, to my left 10, 11, 16, another 10 and third 16 for good measure. If that wasn’t liable to create enough problems – due to the height of the advertising boards and the dugouts, any patrons of said seats were likely to miss parts of the game. They were however found to be both ergonomic and comfortable as I studied the teams’ form on my phone (no programme). 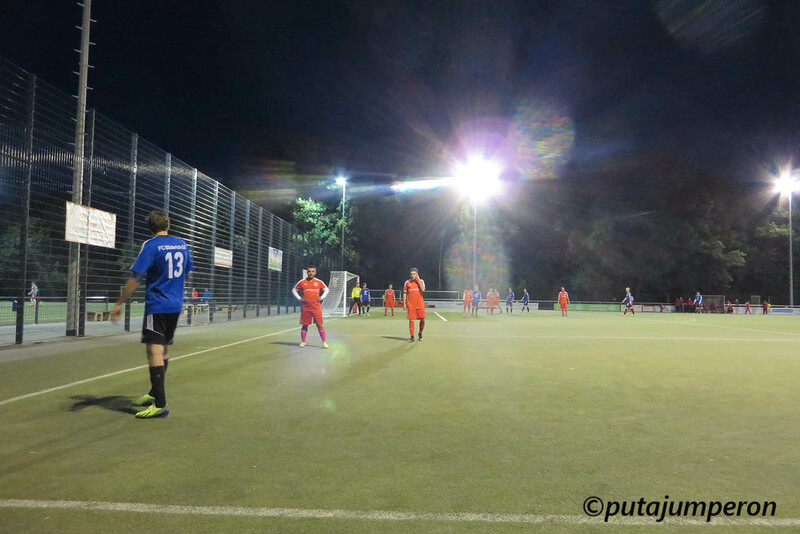 With both tonight’s teams hailing from the Kreisliga A Group 2, comparing starts to the season was relatively easy. 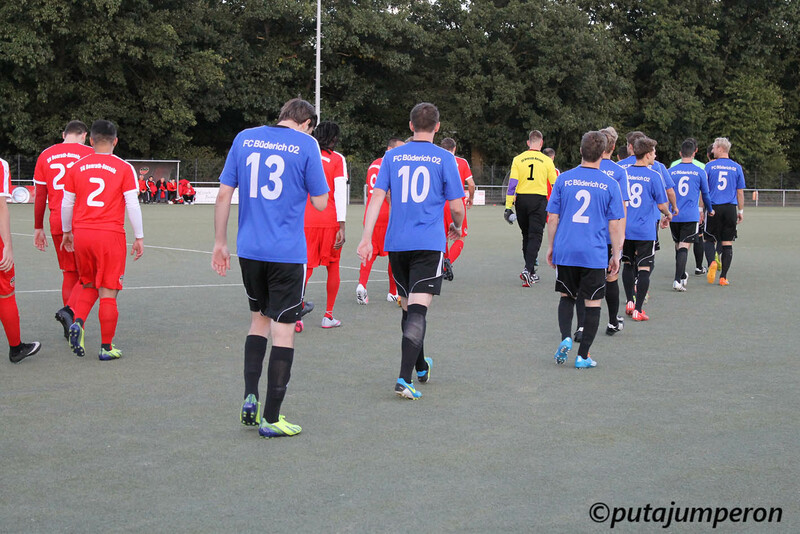 In a fourteen team division, the hosts SG Benrath-Hassels on four points, were sitting just above the possible five relegation places. FC Büderich – disappointingly, not to be confused with the legendary jazz drummer – were top, on maximum points with a whopping goal difference of 15. Having waved at the sparse crowd, tossed, changed ends so that SG suffered more from low sunlight hassles (this joke could run and run) huddled up, HOO-HAR’d and finally kicked off; the first forty-five went completely true to league form. 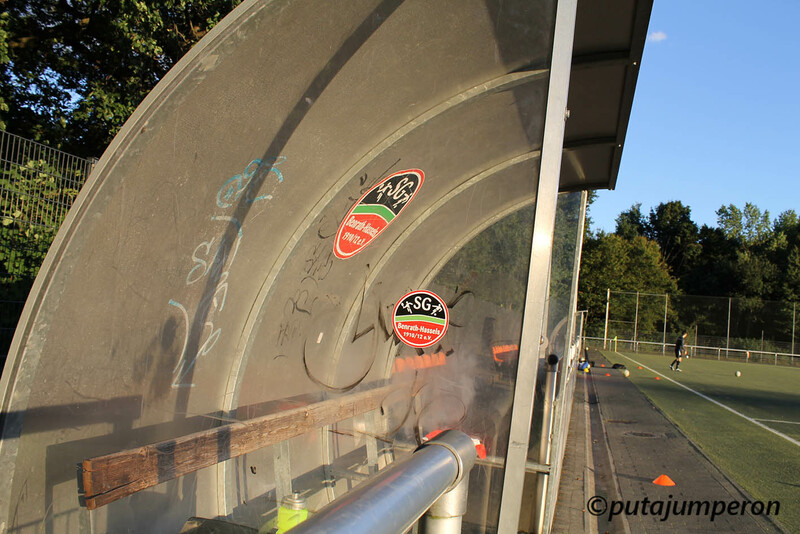 No public announcement explained the (20 minute) late kick-off but, thankfully we still had ten minutes to spare before the next tournament match began; this one was still the very first game of the 2016 Düsseldorf Kreispokal. A critical fact in my journey and, thankfully the only time this issue will come into play. Both sides appeared to adopt regulation four-four-two but once Büderich got their foot on the ball, swift passing movements were interspersed with an almost totally fluid formation. Two at the back, no three, now four… Trying to calculate whether it was planned or not, just five minutes in, my concentration was suddenly broken. “Wie Steht?” I knew the words were familiar, sadly the speed of processing is not what it once was, in this or any language. By the time I got the “null-null” answer out, he’d already walked off. Back in the action, Büderich’s confidence seemed sky-high in comparison to the hosts. Yes, Sascha Hofrath drove the ball narrowly over from a tight angle but, he and his team mates were being confined to hopeful breaks, whilst the visitors patiently built attacks through the dogged Benrath defence. Thimo Stoffers was first to breach the rearguard with a deft through ball to Julian Goroncy, whose cross from wide right brought a great save from keeper Dirk Nöring once Kevin Völler Adducci had powered his header goalwards. Ten minutes later Völler Adducci scuffed his shot wide of the left post when time was easily on his side. Five minutes on, home captain Eugen Filtschenko went from zero to hero as confusion reigned in his box. Beginning with an innocuous punt upfield, Filtschenko poorly headed back to his keeper – probably with his eyes closed – affording a shot on goal which Nöring valiantly parried. Andre Küster’s backpass then came too early and with Nöring still off balance the ball drifted through his legs, heading straight for the net. As Filtschenko desperately scooped the ball off the line the relief was palpable but, it was clear a goal was coming. Seconds later, Denis Hauswald split the defence and Jan Niklas Kühling tapped the ball in. Putting the visitors 1-0 up, was both tragically easy and utterly deserved. In the remaining twenty minutes to the interval, Benrath-Hassels created only one opening – with Küster going close – Büderich conversely had many. The pick of these saw Völler Adducci drag a shot wide, having done all the hard work of finding space from a Goroncy throw, and a Kühling shot across an open goal that team mates were unable to reach. As we trudged off to the warmth, I wondered how the hell we’d get there and back in just 15 minutes, it was so far. Still the coffee was as strong as advertised and I had a cabinet full of merchandise to peruse, whilst adding layers for the impending cold and speculating why my coat pocket was full of dog treats. As the second period began, two changes and the late arrival of the guests heralded a new game plan. For the visitors wide man Stoffers had been replaced by Christian Ecken and more importantly, the hosts removed nippy striker Mohammed El Abduli for the far more imposing Jeff Jordan. As Hofrath curled in an equaliser, from a free-kick just outside the box, I knew the outcome was no longer certain. Soon Büderich stuck a post after two corners were frantically cleared before, a concoction of hefty challenges and cards were introduced as both sides wrestled for control. In fairness – considering there was only a lone referee and respective coaches manning the lines – all the players accepted the decisions without much disagreement. I on the other hand, was far less composed as I was asked , for a second time, what the score was by another late arrival. As the young boy she was with sniggered (probably rightly) at my stupidity, I turned back to the match just in time to see Völler Adducci head the visitors in front, after Nöring spilled an awkwardly bouncing shot. It wasn’t offside, nor was there any contact between the players but, the ref still blew for something, awarded a free-kick and the protests soon died down. Up the other end, Hofrath sent a free-kick just over, and Patrick Truatner fired across the goal, as the play began to stretch further, bypassing both midfields. By the time I’d realised Nöring wasn’t actually taking any of his goal-kicks – Filtschenko was – there were just ten minutes remaining. The thought of extra time and penalties was, with the temperature dropping still and the hot coffee so far away, quite unbearable. To be fair both sides were doing their bit to avoid such consternations however, still I fretted. For the guests, Hauswald was putting in some useful corners, Völler Adducci headed just over, and both Benedict Niesen and Ecken had fine efforts blocked as they fought for space in a crowded box. Despite no one player thereafter looking at all composed, suddenly Benrath-Hassels showed renewed belief whilst the guests endeavoured to end the game quickly. After Kühling forced a corner, which was headed onto the Benrath post, then the shot from the rebound saved, centre-back Bastian Alexander Fröhlich missed a tackle in midfield which would have kept the pressure on the hosts. The ball swept upfield to where both Jordan and Hofrath had been making a nuisance of themselves all half, without either finding the target. This time however Trautner was in support and rifled home from a tight angle. Two minutes on, the omens got far worse for Büderich. If being behind wasn’t bad enough, their dominant defender Oliver Wersig picked a second yellow for stupidly pulling on his opponent’s shirt to prevent another dangerous break. Whistle or not, it was game over; we all knew it. As fans drifted for the warmth, time-wasting and desperation changed little. Manoeuvring myself for a quick exit, I was transported back to Leg O’Mutton Field and Chalky Lane; those early trips in my 2012 FA Cup. Deep down, I knew my journey had truly begun. Soon after, as I followed the youth coach with a very squeaky shoe into the carpark my mind moved to the future rounds. Over the next 1000 days, there are still another eighteen games to go, all of which would be settled without replays. Whilst I knew I’d be back at Am Wald in Round 1 – to face either SV Hilden-Ost or TuS Homberg – nothing else was certain. 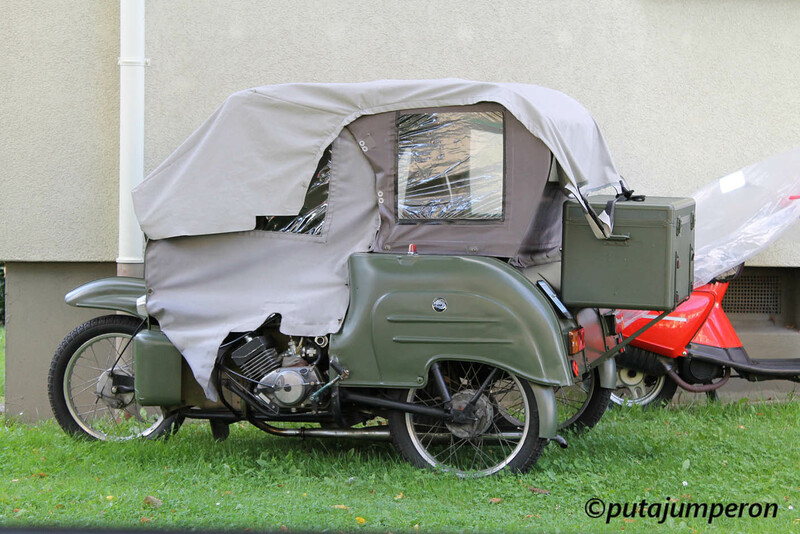 This entry was posted in 2015-2016, Kreispokal Düsseldorf and tagged Am Wald, Benrath, Benrath Palace, Berlin Wall, bier, Bitburger, Buddy Rich, David Hasselhoff, DFB Pokal, FC Büderich, Hassels, Karl Hohmann, Karl Theodor, Kevin Bacon, Knights of Benrode, Knights of Eller, Kreisliga A, Kreispokal Düsseldorf, Landesliga Niederrhein, Qualifikationsrunde, SG Benrath-Hassles, Sport Gemeinschaft Benrath-Hassels 1910/12 e.V., Tschammerpokal, wurst. Bookmark the permalink.